OutsidePursuits.com recently announced the results of their Editors' choice awards for the top rated Backpacking Sleeping Pads. APOLLO BEACH, Fla. - June 17, 2017 - PRLog -- OutsidePursuits review editors chose the following sleeping pads after extensive testing of durability, comfort, weight and packability. The Z Lite Sol is a classic design and has been around for years and perfected the Therm-a-Rest to be comfortable while being lightweight. The "egg-crate" foam construction of the pad folds up into a compact package that clips on the bottom of a backpack. The tried and tested Z Lite wins the Outside Pursuits "Editors' Choice" award. 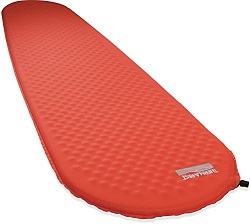 The ProLight sleeping pad is another excellent offering from Therm-a-Rest and has a very different design. The ProLite is a "self-inflating" backpacking sleeping pad. This type of pad inflates itself by simply unfolding it. It features a very lightweight and packable design and wins the "Top Pick" award. The Klymit sleeping pad features a "blow up" design that has V shaped pads that make it comfortable while giving it the smallest possible size when folded up. The pad needs to be inflated by blowing into it; this gives the hiker that ability to inflate it to their desired comfort level. With a small packed size and lightweight it wins the Outside Pursuits "Best Buy" award. Headquartered in Apollo Beach, FL, OutsidePursuits LLC does extensive side by side testing of outdoor gear. The website is a free to the public resource for anyone who loves the outdoors. The website has several categories of equipment reviews, including: Scuba Diving, Biking, Camping, Hiking and Kayaking. Once the reviews are completed the results are published, making it easy for the reader to decide which is best for their needs. Readers can visit the site at: http://www.outsidepursuits.com.